Xournal is an application for notetaking, sketching, keeping a journal using a stylus. It is free software (GNU GPL) and runs on Linux (recent distributions) and other GTK+/Gnome platforms (also support Windows now). It is similar to Microsoft Windows Journal or to other alternatives such as Jarnal, Gournal, and NoteLab. 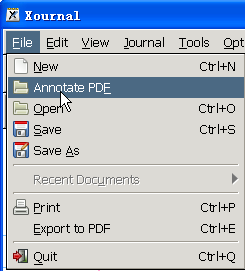 Xournal supports annotates PDF(render/import PDF) and export annotated PDF. It uses libpoppler to render/import PDF, and uses poppler-glib to create Annotated PDF, but it is a pity that it convert the original PDF to image version PDF.